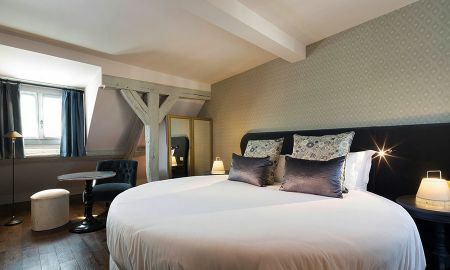 Les Plumes hotel is a magnificent 4 star hotel in Paris, which combines modern with ancient style dating back the 19th century. You will enjoy the relaxation of a unique destination, matching the historical authenticity with modern amenities and the guests will be dived into a romantic and unique experience. The 35 rooms and suites are comfortable, fully equipped and you'll enjoy peace and harmony. The furniture of the rooms is inspired by love stories of famous writers such as Paul Verlaine, Juliette Drouet, Arthur Rimbaud, Alfred de Musset and George Sand. Every morning, the Les Plumes hotel offers a delicious breakfast buffet which satisfies all tastes and provides the necessary energy for a day full of sightseeings and leisure. In addition, you will spend your moments of relax in the welcoming Honesty bar or in the lounge, where drinks are served. When the weather is fine, you can enjoy the sun on the hotel's patio. Les Plumes hotel offers an ideal position which allows to reach the capital's tourist attractions, restaurants and shops. The metro station "Cadet" is the closest one and it is a short walk from the hotel. Les Plumes hotel boasts a pleasant atmosphere and is very close to the Museum of Freemasonry, the Grevin Museum, the Théâtre des Variétés, the Louvre museum and Galeries Lafayette. All of these destinations may be reached by line 7 crossing Paris from north to south. The famous Pigalle and Montmartre districts rise nearby. The airport is about 35 minutes from the hotel.